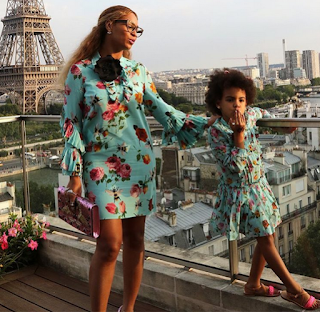 CHECHESMITHNATION : Beyonce And Baby Blue Goes Matchy In Gucci Frock! Beyonce And her daughter Blue Ivy looking lovely in matching Gucci floral dress. Bey paired her look with pink purse and heels co-ord, while her daughter teamed her cute look with pink sandals. 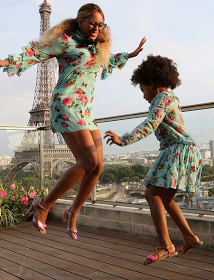 We are loving Beyonce's ruffled sleeves and Blue's pleated skirt, as they jump at a balcony over looking Eiffel Tower in Paris. Bey flaunts her cute legs as she pose up a storm.